All very well. Product, packaging, delivery time. No surprise, highly recommended. Changing the starter engine of the motorcycle is not complicated if you know how to do it or accounts with the experience of the professionals, as it is an electrical part and has an influence on the engine of your motorcycle, either 2T or 4T, we recommend you in any case that you go to your motorcycles workshop if you have any doubts in your replacement. 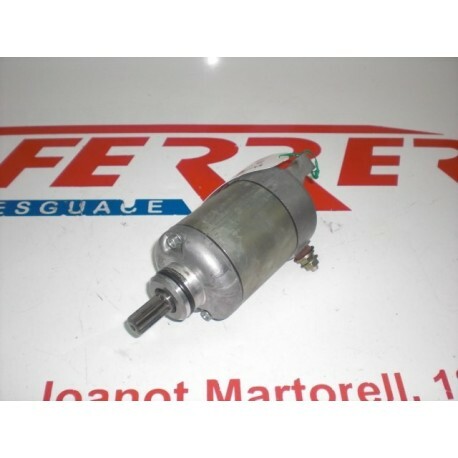 The starter motor is a fully enclosed and hermetic electric motor whose mission is to turn on the main motor of the motorcycle or scooter, the only type of motorcycle that does not mount it are the off road motorcycles since its start is with lever start. 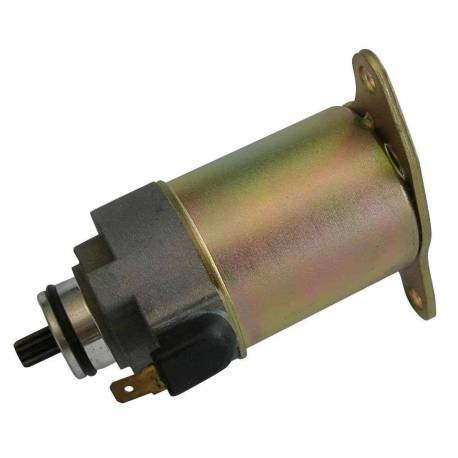 Motorcycle engine starter (non-original compatible model). How does a starter work? When the contact of our motorcycle is activated, the solenoid is in charge of driving the pinion, it engages the engine and starts the engine of the motorcycle..
- When the ignition is activated, a squeal sounds in the starter motor and the motorcycle does not start, this malfunction indicates with almost certainty that the pinion is broken or stuck. - Sometimes, a fault in the power supply is responsible for the malfunction of the engine. If the motorcycle tries to start, but can not and the lights on the dashboard are at low intensity, it may be due to poor battery or alternator conditions rather than a malfunction of the starter. How to make the change of the starter motor, basic principles. El motor de arranque se sustituye por completo, salvo que sólo esté afectado el piñón de arranque o sus escobillas que si que lo podemos encontrar por separado. Generally, in the first place, it will be necessary to remove the fuel tank and then release the plugs of the fuel sending unit and the pump. Afterwards, the clamps will be loosened and the ends of the cables will be covered with insulating tape so that they do not get dirty. Once you remove the deposit you can access the starter motor. Depending on the type of motorcycle you have, you will have to disassemble the air filter and the body of the injection. Remember to cover the entrances and cables so that they do not come in contact with other elements and avoid breakdowns. In classic or old motorcycles or nacked-type motorcycles it is not necessary to disassemble the tank as we can access it from the side of the motorcycle. Remember that in all cases the polarities and operating characteristics of the starting motor of origin must be respected. On our website you can search and buy two types of starter engines, keep in mind that there are compatible starters for several motorcycle models, on the one hand we have the original starter motor that assembles your motorcycle that we have achieved thanks to the realization of an exploded part of a motorcycle in disuse, this piece of scrapping has been fully checked by our mechanics especially at the time of the start-up of the motorcycle and in the verification of the wear suffered in the toothing of the pinion of the motor. On the other hand we also offer you the possibility of acquiring at a very economical price starter engines totally compatible with the original model that mounts your motorcycle, these starter engines respect the same ranges of work, voltage and intensity as the original in addition to maintaining its same assembly system. If you are looking for the original engine for your motorcycle you must select the brand and model of your motorcycle on our website, if instead you prefer an unused starter motor that is fully compatible with the original one that mounts your motorcycle and at a price very cheap you can find it in the section of electrical spare parts.